Football season in my house means spending time listening to my husband yell at the TV until the Super Bowl in February. He’s either happy with his team or angry with his team…pretty typical for most football fans. Because we live in NC, he doesn’t get to see his beloved Detroit Lions often, so sometimes we’ll head out to a local bar to watch them play and have a few wings and beers [I’m no salad eating date!]. Just because we’re going to a bar to watch sports, doesn’t mean there isn’t an opportunity to be fashionable! 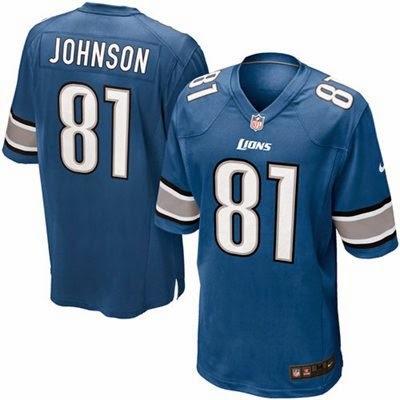 My husband would love to sport Megatron’s jersey! Fanatics.com is a great site to purchase team gear for affordable prices. They have such a versatile selection for all the sports and teams you can imagine! And while I do think female jerseys are cute, I chose to go the color themed route, and mix and match team colors. One last thing: GOOOOOO LIONS! !